I've added some meat to the game over in Praxis...I'll try to keep all locations up to date with my game development. For the moment, here's the details I added over there. It's post apocalypse. Life is out of balance and the dreaming needs to be redreamed. There is an ancient network of song-lines across the nation, like the webbing of a spider; it holds the world together. But it has fallen into dissarray. The old spirits have lost their way, and new spirits from immigrant cultures have found themselves in a dangerous world far from their homelands. The old rituals need to be refound and new rituals need to be created. Spirits old and new need to be appeased through new rituals appropriate to a new age. The ways of pre-colonial times have lost much of their relevance, but so have the ways of the colonial era. It is time to reforge a new dreaming, using whatever is available. I'm pretty much ripping the guts out of my game "FUBAR". Characters begin defined by 4 traits. These starting traits are considered permanent. Dance: The way you move. In cultures around the world, the spirit world responds to the energies of biological movement. But there is something more to it, dance describes how you do other things. Are you graceful? Are your moves sudden and dramatic? Are you fluid? Do your movements convey deeper emotion? Are you intricate and subtle, or sweeping and grandiose? A variety of dances will be provided, each with five types of associated action. A player starts by underlining two of those actions to reflect talents they have acquired through their study of the dance. Dances might include traditional types from around the world, various ballroom styles, hip-hop, crumping, or even martial arts such as tai-chi or capoiera. A character may learn additional dances from the others their are travelling with, or people they meet along the way. People: Who you identify with. This is less about the genetic heritage you might possess and more about who raised you. This incorporates the mannerisms you might possess, the idiosyncacies in your language and the way you view the world. A variety of people will be provided, and in most cases a bonus will be gained from dealing with other people who also share that upbringing, while there will be other groups who will raise an immediate distrust of the character due to their mannerisms. A character may choose to forsake their people, but they will automatically suffer distrust at the hands of their former people and they need to prove themselves to a new people before they may claim another trait of this type. Edge: Your advantage over others. This might be a genetic heritage, or it might be a tool that you possess from the old times. Whatever the case, it is something you posess that the others around you do not. It is something that marks you as different, even if it doesn't appear scarred into your skin. Again, a variety of edges will be described, including vehicles, weapons, genetic mutations, special training, etc. Like dances, each character begins with one edge, but they may pick up new edges along the way. Similarly, they begin with five associated actions that might gain a bonus, two of which have been underlined/mastered. Scar: Your first marking. All of the characters in Walkabout are possessed with at least one sacred marking. It could be a tattoo, it could be a ritual scar. Whatever it is, it means something sugnificant to the character and to the spirits of the dreaming. Possessing such a mark shows that you have accomplished a deed and have been recognised for it. Any time you attempt to perform the deed again, the people around you will be expecting a repeat performance. All scars are marked on the character sheet. A character may have a maximum of 13 scars (Torso (Front and Back) - Abdomen (Front and Back) - Thigh (x2) - Shin (x2) - Upper Arm (x2) - Lower Arm (x2) - Head). Note: A common Edge trait among spiritual leaders is the ability to paint temporary scars onto people to give them bonuses for upcoming encounters (some characters may learn this edge), they may never paint these scars onto themselves unless they possess a scar allowing them paint in the outlines. Over the course of play, characters pick up temporary traits, they may make these temporary traits more enduring by having someone paint a temporary scar onto them. If they earn enough successes to make a trait "permanent" it lasts until the end of the current story unless it is permanent carved into their flesh as a tattoo or scar. I'm still working through this in my head, there are a few things that don't quite sit right, and a few other concepts I'd like to incorporate...but that's my current working plans for character development. As for what the characters do...everything will work in cycles. The characters will be trying to push a wheel clockwise while the forces acting against them will be pushing counter-clockwise. The characters will be encountering a series of scenes to cleanse a song-line, while the dark forces of the world will be trying to prevent them from doing this. Every success a character gains will be an opportunity to improve their abilities and gain new traits, or an opportunity to restore some of the world's balance. Players will be forced to choose whether to use immediate gains or build up for the long term. A story may focus around the cleansing of song-lines of a few kilometres or a few hundred kilometres, depending on how long the session is intended to last. 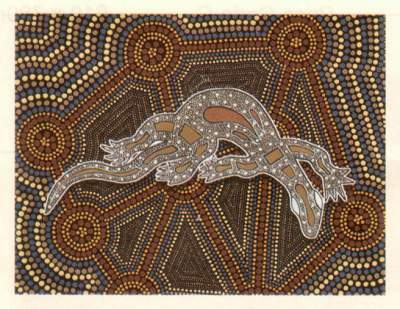 Then think of the stereotypical Australian Aboriginal forms of dot art and x-ray art. Imagine the man as a form drawn in x-ray art, and the outer circle drawn as a circular path of dots with a number of larger "campsite circles" around the perimeter. If you want an idea, click here...but change the lizard form in the middle to a form more closely resembling da Vinci's Vitruvian Man. That's the core character sheet. Each of the body segments is left empty to note a ritual paint pattern (in pencil) or a ritual scar/tattoo. The outer ring is used to chart a character's imbalance from the natural order (such an imbalance might come from spiritual corruption, mutation, implants or "something else". Temporary corruption is filled into the circles in pencil, permanent corruption is marked in pen. A similar drawing depicts the songline being cleansed, this is effectively the character sheet for the environment in which the game occurs. A single path passes across the centre of the page with a number of "campsite circles" along it. A quick game will have three or four campsite circles representing a line that is only a few kilometres in length. An epic game might have twenty or more "campsite circles" (representing a few hundred kilometres), but such a song-line is better divided into several smaller songlines (no more campsites than the number of characters involved). The characters literally travel along this path, cleansing it as they go, issues to be "rebalanced" are represented by a pile of tokens are spread across the songline. Note that it isn't necessary to cleanse the songline in order from one end to the other. A group of characters could find things easy at one end (few tokens between the "campsite circles"), and hard at the other (many tokens). Another group might find it easy at both ends and difficult in the middle. Yet another group might find a balance across the entire songline. The idea is the remove as many tokens as possible from all parts of the songline, making the journeys safe for future travelers along the path. All players (including the GM) create a character, an antagonist (randomly allocated to a character), a tool useful for eliminating an antagonist and an imbalance symptom. Characters and antagonists are made the same way, useful tools and imbalance symptoms are written on index cards as quick sentences to be fleshed out in the course of play. The imbalance symptoms, useful tools and antagonists are shuffled. Each time the characters investigate a part of the songline, they reveal one of the imbalance symptoms. When they start making headway against the imbalance (eliminating at least a third of the original tokens), they may be rewarded with the next useful tool on the pile. Once they reach a climax (eliminating about two thirds of the original tokens), they face the next antagonist...with successful investigation, the GM reveals how this particular antagonist was behind the imbalance. Short songlines may have more imbalances than sections, in such cases, resolving the initial imbalance simply reveals the next set of problems...perhaps the characters have caused this new imbalance while trying to rememdy the first set of symptoms...or maybe the new problem is simply more insidious and was hiding behind the original problems. Long songlines may have sections without an imbalance, there is no problem with this either. Not everything has to have problems associated with it. The GM sets scenes, the players initiate actions within those scenes (pretty traditional). Everything defaults to a standard difficulty, unless the GM wants to make things harder. If the GM wants to make things harder, they draw from the tokens on the songline section, each token makes things 1 degree incrementally harder. A sequence of actions makes a scene. Once there are no more immediate actions being taken, a scene comes to it's conclusion. Any situational traits gained during the scene are lost (whether bonuses or penalties). At the end of a scene, the players may agree to call the end to an act. Any short-term traits currently possessed are lost (whether bonuses or penalties), the GM rolls a die for every expended token. On a 5 or 6 they may return the expended token to the location where it was used, or one of the adjacent songline sections. 1. If all the tokens have been removed from the songline it is once again considered a safe path for travel. (If there are still antagonists left, then they may need to be faced again later, but their immediate dangers have been subdued). 2. If all the antagonists have been eliminated, the initiators of the songline imbalance are gone...but there might still be unresolved problems. (If any songline section still has two or more tokens on it, then there may be another antagonist waiting to cause problems in a future session). 3. If all the characters have been eliminated (through death, fleeing the area, insanity, or something else), the area is still dangerous. At the conclusion of a game all long-term traits are lost (whether bonuses or penalties). One permanent trait may be kept. Only one permanent trait is kept this way per game, unless the player is willing to mark their character sheet with a permanent negative trait. If they keep a second trait, they mark a section of their body with a scar indicating a single bonus and a single penalty. The player may choose to write a single sentence describing the circumstances this scar/tattoo commemorates. Your questions have really gotten me thinking. That's a great point about randomness potentially leading toward incoherence. In response to both of those, I had just been thinking of using this game as a "rewritten-from-scratch" update/hack for my FUBAR game. The chaotic free-for-all has been working really well in a game about betrayed people seeking vengeance, but these posts have really made me think more deeply about the experience of this game. As a result, I'm thinking of changing some of the core defining traits of characters...and changing up the structure a bit. My first thought was to create a singular game that focuses on a single section of a songline...a number of these singular episodes would build up to the cleansing of an entire songline. In this method, the game might run a bit like "Silent Hill" (I'm thinking more of the movie, because I haven't played the computer game). In this set-up a group of characters would encounter problems (represented by tokens held by the GM), they would solve these problems in the physical world only to find that there was something deeper at work (tokens eliminated in the physical world would transfer across to the dreaming). Characters would then be forced to confront the deeper issues causing the problems in the dreaming (tokens eliminated in the dreaming would be removed permanently). In this set up, tokens basically flow from the source of the problem into the dreaming, and from the dreaming into the physical world. Characters work to prevent the problems by following this stream in reverse. 1. Identify the problem in the real world. 2. Hold back the immediate symptoms long enough to investigate where the breach between physical realm and Dreaming occurs. 3. Step through to the Dreaming and draw close to the source of the spiritual issues. 4. Face the source of the problem in the Dreaming. 5. Eliminate the residual issues now that the source has been dealt with, and return. (This basically follows the structure of the archetypal "Hero's Journey"). Dance: The way you move. I still like this the way it is, no real changes here. I'd love to see a dreamtime hip-hop battle, or a dreamtime headbanging heavy-metal air guitar showdown. Advantages from your dance are always available. People: The people whom you identify with. Aboriginal culture (hell, ALL culture) is about community, it's about who you deal with and how you deal with them. Your first people will be the culture in which the character was raised. Each culture will have a range of stereotypical abilities that are available in the physical realm. Edge: Your advantages in the physical realm. Your first edge is either a signature tool (possibly a vehicle, weapon or genetic mutation), or a signature skill (occupational or otherwise). It only provides an advantage in the physical realm. Scar: Your advantages in the spiritual realm. Your first scar is a mark allowing you to cross between the physical and spiritual realms. Future scars may allow you to manifest your edges in the dreaming, the bonuses associated with your people, or other bonuses that might be accumulated along the way. As characters continue their journey through life, they make suffer wounds that permanently disfigure them (thus stripping away their total available scars). Sojourner's Path: The method you use to breach the barrier between physical world and Dreaming. This could be hallucinogenic drugs, it could be a form of astral projection, literally sleeping and engaging in lucid dreaming, or a variety of other methods. Let's look back at the character sheet, the humanoid figure at the centre stays the same because the use of scars is effectively unchanged (in fact they're probably now more important). But my thoughts about the outer ring have started to crystallise, it represents effective hit points in the dreaming. Characters place tokens in a number of the outer circles based on their preparations for entering the dreaming (some characters may have scars that automatically improve these preparations). While in the dreaming, any time the character would earn a negative trait (or lose a positive trait) they may instead choose to lose one of these tokens. Sometimes a character may suffer such a dramatic injury that their very soul is corrupted by the damage. In such a case, one of the circles is completely removed from the outer ring (either crossed out or physically ripped away from the sheet). Characters who lose all of the circles on their outer ring are never able to cross into the Dreaming again. In the physical realm, the outer ring doesn't do a lot. I'm not sure whether to tie it into some kind of mechanism for characters in the physical realm to resist possession or relate to other powers from the dreaming...it seems a bit of a stretch at this point, it doesn't seem a neat fit, and I don't want to force something that just doesn't for the sake of it. FUBAR uses the idea where each player contributes an antagonist, a location and a magic widget/maguffin. Over the course of play, these are incorporated into a story by the GM. When things slow down, the GM randomly draws a new antagonist, when they can't think of a location they draw one from the relevant pile, when they think it's time for a reward after a conflict or after an objective has been achieved the next random one is up for grabs. I'll admit that it's a bit erratic, and has the potential to get silly if one of the players isn't serious when they write up their card(s). But it's designed for a fun game. Do I want Walkabout to be a bit of fun? In which case I'd tweak the FUBAR system but keep it relatively intact. Do I want it to be more dramatic? In which case I really need to think of something more. I haven't had a good experience of a dramatic game without a strong visionary in control of the narrative. I've struggled with creating a GM-less game, or a game with shared GM responsibilities where good drama is the aim. Do I want something scary?Stephen King wrote in Danse Macabre (his essay on horror): �I recognize terror as the finest emotion and so I will try to terrorize the reader. But if I find that I cannot terrify, I will try to horrify, and if I find that I cannot horrify, I'll go for the gross-out. I'm not proud.� A lot of so-called horror games simply play to the "gross-out" angle, many of the Cthulhu based games I've played have tried to play to deeper emotions but have fallen flat. In my experience, trying to develop something that captures this emotional resonance requires a good GM using and abusing the systems to their own ends for a specific scenario. I could really see this game premise working well to that end with nightmares of the Dreaming and potential soul corruption, but ten days isn't long enough to really refine this style of play. If I wanted to do it, I'd want to make sure it is done right. More work to do...but that's my current state of affairs. It's looking great, Michael. I like what it's shaping into. Horror is a really hard thing to do in a game. Hard for me to do, anyway, but I'm rather detached from fictional horror (real life stuff is way scarier). I'd be interested in seeing what you come up with, whether it's during the contest or added after. Here's a link over the the Praxis thread to show the character sheets I'm working on. When I read your post about desert nomads and alchemy, of course, I thought of Full Metal Alchemist. When you went on to talk about community, spirituality and alchemy, I thought of the Buddhist path of enlightenment and Chinese alchemy. 2) City - The City needs to be healed and so does your mind. 5) Journey - Did you make this Journey ofr the world, or yourself? Do you spread the Alchemy, or advance it? It doesn't sound exactly the way you wanted to go, but I thought if I shared it, it might inspire you to come up with a cooler structure for your game. Also, you have totally inspired me to make a FMA game! If you like it, and if you think it's possible, I give you full permission to write up a FMA hack of my game once Game Chef is over. At this stage, I'm still deciding on the actual story arc progression for the game. I was suggesting the 5-part story arc for your game actually. But I think you can do the first 4 parts independently, but it seems like the 5th has to be last for it all to make sense. I'm going to adopt this cycle as a long term experience path for the characters in the game. 1) There are six circles around the character sheet, indicating degrees of spiritual attunement/enlightenment. The first is instantly available as it represents a characters ability to step into the dreaming. The remaining five could be achieved by completing each of the five steps indicated (one per session, if you can justify it through events you've participated in). In this way, it takes a minimum of five games for a character to become a master of spiritual ways. Once they reach this point, a character must decide whether to ascend to the spirit realms and become a totem or ancestral protector...or stay with a tribe of people and become their shaman. Either way, this character's story has reached it's conclusion. 2) Otherwise I could use the first and last parts of the story arc, as a set-up and a resolution, then I use any of the middle three. The middle path chosen determines an advantage gained by a character. As an example, a character following Community-City-Journey path would gain a bonus to "city" related spiritual actions. In this way, a character could end up being focused in dealing with a specific type of spiritual group, or they could spread out their development to be a jack of all trades in their spirit dealings. I'll start formally writing up other parts of the rules today...hopefully while I'm doing that, one of these options will interface well with another part of the game (and that will make the decision for me). Still needs a lot of work, but that will have to wait for the contests aftermath. Not big compared to hardback games you'd find on the shelf of your local gaming store, but big compared to most other contest entries. I just thought I let everyone know that the first errata/addendum for Walkabout has now been released. I guess that makes it like a real roleplaying game now. It can be found here on my websites new Walkabout page. Or here as a direct download. The file consists of the pages I didn't get to finish in time for the competition deadline and a few other bits and pieces that accidentally got culled in the rush to make an entry. I've also since read through my text a bit more thoroughly and have found artefacts dating back to earlier versions of the game (references to "lowlifes" from FUBAR rather than the "Wayfarers" of Walkabout), so if there's anything else in it that doesn't make sense, please let me know. If you do end up playing the game, please let me know how it went...and please submit the session over to the Game Chef site. Quick note on the Walkabout page; it looks like it got cut off. The page I see ends with "In time I joined a Wayfarer circle, to pass on the goo" and doesn't have any links. Once again, I find that your own work is making me feel a lot better about mine; I released a revised version of Egregore (there were some egregious last-minute editing errors and a few things that wanted clarification) this week. Although I didn't change anything mechanically - the new version should be 100% intercompatible with the original Game Chef download. I'm going to start putting together further improvements into a new, non-Game Chef version. I'm not quite sure what to make of that comment. I am going to do a drastic rewrite of Walkabout, I'm working on the play examples now (they are currently sitting at five pages, and will probably expand out to at least a dozen). I'm also seriously considering some tweaks to the rules, but I probably won't formalise those changes until I get some feedback on the game. As for a line getting cut off...I was pretty sure I checked that, but the final days was a bit of a rush.